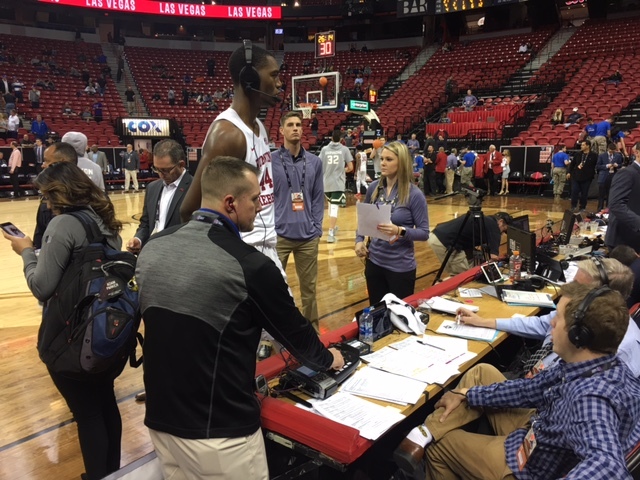 UNLV, despite blowing a 13-point second half lead, snapped it’s five-game losing streak with a 97-90 overtime victory over Air Force on Wednesday afternoon in the first round of the Mountain West Tournament at the Thomas & Mack Center. The Runnin’ Rebels (20-12), who hit the 20-win mark for the first time since the 2013-14 season when they finished 20-13, now face defending tournament champion and two-time regular-season Mountain West champion Nevada (26-6) at noon on Thursday afternoon in the quarterfinals. The 22nd-ranked Wolf Pack, who handed UNLV an ugly 101-75 loss eight days ago at the Thomas & Mack but lost to the Runnin’ Rebels, 86-78, on Feb. 7 in Reno minus Mountain West Player of the Year Caleb Martin, will be trying to become the first team in the 19-year history of the Mountain West to win back-to-back tourneys along with back-to-back outright regular-season conference titles. And whoever wins the game still has to win two more games on Friday and Saturday to earn the Mountain West’s automatic bid to the NCAA Tournament. KEY PLAYERS: Freshman center Brandon McCoy managed to stay out of foul trouble and played 37 minutes, finishing with game highs in points (23), rebounds (12) and blocks (three). Junior forward Shakur Juiston added 21 points, including six during a game-deciding 15-2 run in overtime. “I know Caleb was out but that was a big win for us. It was a win on the road against a top-25 team. And they played like a top-25 team when they came here. … Tomorrow we’ll lace them up again and let the best team win.” – UNLV coach Marvin Menzies on playing in-state rival and Nevada in the quarterfinals on Thursday afternoon. UP NEXT: Mountain West Tournament quarterfinals: No. 8 seed UNLV (20-12) vs. No. 1 seed Nevada (26-6), Thursday, Noon, Thomas & Mack Center. CBS Sports Network. NOTABLE: Air Force didn’t take its first lead until the 4:35 mark of overtime (78-76) on a layup by Trevor Lyons. … The Rebels, who blew a 13-point second half lead, trailed a total of just 58 seconds. … The Falcons, who were led in scoring by senior guard Jacob Van (20 points), finished with a 53-17 edge in bench points. … UNLV outrebounded Air Force, 41-31, and had a 19-7 edge in second chance points. … The Rebels were 14-of-17 from the free throw line in overtime and finished with a 26-13 edge in made free throws, attempting 17 more (37-20) than Air Force. … Rebel PG Jordan Johnson finished with 10 points and 12 assists, his third double-double of the season. … Three Governor’s Series points will be awarded to Thursday’s winner. … The winner of Thursday’s contest will face the winner of the 2:30 p.m. quarterfinal between No. 4 seed Fresno State and No. 5 seed San Diego State in Friday night’s semifinals at 6 p.m. The championship game is Saturday at 3 p.m.